I’ve published a few times in academic journals. 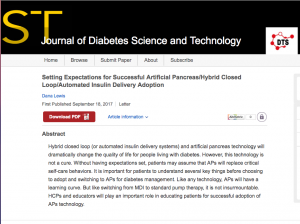 Last year, Scott and I published another Letter to the Editor in JDST with the OpenAPS outcomes study we had presented at the 2016 ADA Scientific Sessions conference. While there are many healthcare providers, researchers, industry employees, FDA staff, etc. who read blogs like this and are up to speed on the bleeding edge of diabetes technology… there are easily 10x the number that do not. This means many also don’t know about the DIY solutions available to patients – whether that be DIY tools like xDrip(+); Nightscout for remote monitoring; DIY closed looping; DIY open looping tools; or DIY tools for automatic basal rate and other ratio adjustments. And if they don’t know about the existence of this world, they won’t know about the valuable lessons we’re learning and won’t be able to share those lessons and knowledge with other healthcare providers and the patients that they treat. So, in my pursuit to find more ways to share knowledge from our community with the rest of the diabetes community, this is why we submit abstracts for posters and presentations to conferences like ADA’s Scientific Sessions. Our abstracts are evaluated just like the abstracts from traditional healthcare providers (as far as they can tell, I’m just another academic, albeit one with fewer credentials ;)), and I’m proud that they’re evaluated and deemed worthy of poster presentations alongside mainstream researchers. Ditto for our written publications, whether they be letters to the editor or other types of articles submitted to journals and publications. We need to find more ways to share and distribute knowledge with the “traditional” medical and academic research world. And I’d love to do more – so please share ideas if you have them. And if you’re someone who bridges the gap to the traditional world, I appreciate your help sharing these types of articles and conversations with your colleagues. You are the only thing holding yourself back from trying. Maybe it’s trying to DIY closed loop at all. Maybe it’s trying to make a change to your existing rig that was set up a long time ago. Maybe it’s doing something your spouse/partner/parent has previously done for you. Maybe it’s trying to think about changing the way you deal with diabetes at all. Trying is hard. Learning is hard. But even harder (I think) is listening to the negative self-talk that says “I can’t do this” and perhaps going without something that could make a big difference in your daily life. 99% of the time, you CAN do the thing. But it primarily starts with being willing to try, and being ok with not being perfect right out of the gate. 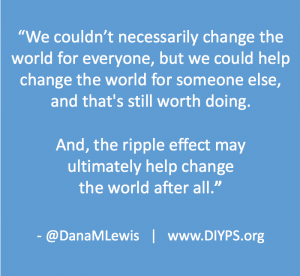 I blogged last year (wow, almost two years ago actually) about making and doing and how I’ve learned to do so many new things as part of my OpenAPS journey that I never thought possible. I am not a traditional programmer, developer, engineer, or anything like that. Yes, I can code (some)…because I taught myself as I went and continue to teach myself as I go. It’s because I keep trying, and failing, then trying, and succeeding, and trying some more and asking lots of questions along the way. You really don’t particularly need to have any technical “ability” or experience. You DO need to know that you don’t know it all, even if you already know a thing or two about computers. You only need to be willing to TRY, try, and try again. …but there’s help from the community to help you learn what you need to know. The learning is a big piece of this, because we’re completely changing the way we treat our diabetes when we go from manual interventions to a hybrid closed loop (and we learned some things to help do it safely). You can do this – as long as you think you can. If you think you can’t, you’re right – but it’s not that you can’t, it’s that you’re not willing to even try. This list of things gets proved out to me on a weekly basis. I see many people look at the #OpenAPS docs and think “I can’t do that” (and tell me this) and not even attempt to try. What’s been interesting, though, is how many non-technical people jumped in and gave autotune a try. Even with the same level of no technical ability, several people jumped in, followed the instructions, asked questions, and were able to spin up a Linux virtual machine and run beta-level (brand new, not by any means perfect) code and get output and results. It was amazing, and really proved all those points above. People were deeply interested in getting the computer to help them, and it did. It sometimes took some work, but they were able to accomplish it. OpenAPS, or anything else involving computers, is the same way. (And OpenAPS is even easier than most anything else that requires coding, in my opinion.) Someone recently estimated that setting up OpenAPS takes only 20 mouse clicks; 29 copy and paste lines of code; 10 entries of passwords or logins; and probably about 15-20 random small entries at prompts (like your NS site address or your email address or wifi addresses). There’s a reference guide, documentation that walks you through exactly what to do, and a supportive community. You can do it. You can do this. You just have to be willing to try. 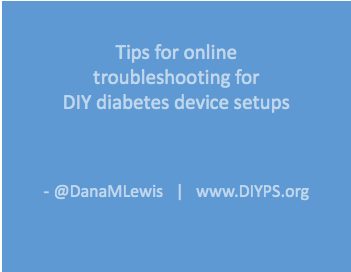 It’s been two years since my first DIY closed loop and almost two years since OpenAPS (the vision and resulting ecosystem to help make artificial pancreas technology, DIY or otherwise, more quickly available to more people living with diabetes) was created. I’ve spent time here (on DIYPS.org) talking about a variety of things that are applicable to people who are DIY closed looping, but also focusing on things (like how to “soak” a CGM sensorr and how to do “eating soon” mode) that may be (in my opinion) universally applicable. However, I think it’s worth recapping some of the amazing work that’s been done in the OpenAPS ecosystem over the past year, sometimes behind the scenes, because there are some key features and tools that have been added in that seem small, but are really impactful for people living with DIY closed loops. 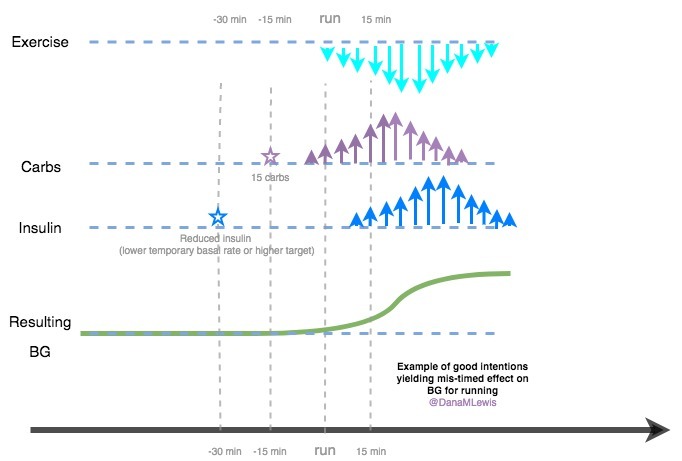 This is an “advanced feature” that can be turned on by OpenAPS users, and, with reliable entry of carb information, will help the closed loop assist sooner with a post-meal BG rise where there is mis-timed or insufficient insulin coverage for the meal. It’s easy to use, because the PWD only has to put carbs and a bolus in – then AMA acts based on the observed absorption. This means that if absorption is delayed because you walk home from dinner, have gastroparesis, etc., it backs off and wait until the carbs actually start taking effect (even if it is later than the human would expect). We also now have the purple line predictions back in Nightscout to visualize some of these predictions. This is a hallmark of the original iob-cob branch in Nightscout that Scott and I originally created, that took my COB calculated by DIYPS and visualized the resulting BG graph. With AMA, there are actually 3 purple lines displayed when there is carb activity. As described here in the OpenAPS docs, the top purple line assumes 10 mg/dL/5m carb (0.6 mmol/L/5m) absorption and is most accurate right after eating before carb absorption ramps up. The line that is usually in the middle is based on current carb absorption trends and is generally the most accurate once carb absorption begins; and the bottom line assumes no carb absorption and reflects insulin only. Having the 3 lines is helpful for when you do something out of the ordinary following a meal (taking a walk; taking a shower; etc.) and helps a human decide if they need to do anything or if the loop will be able to handle the resulting impact of those decisions. 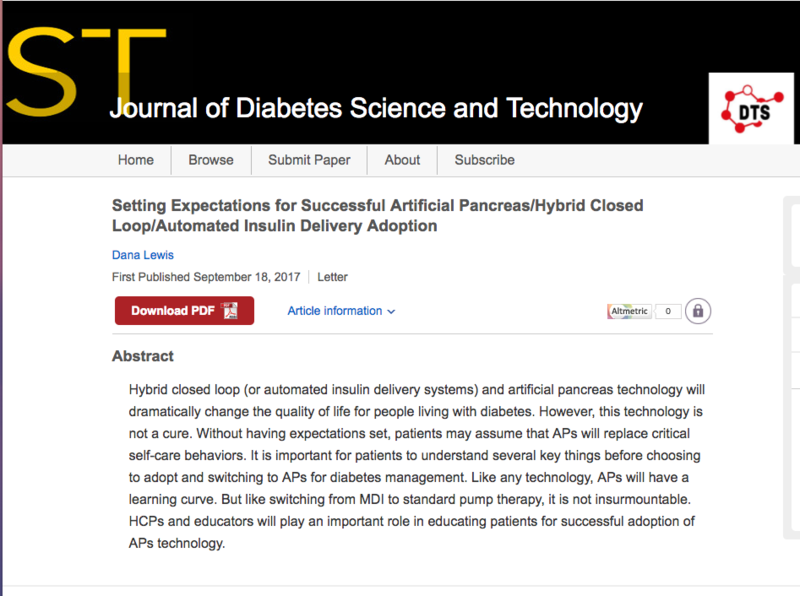 This is the file where people can adjust default safety and other parameters, like maxIOB which defaults to 0 during a standard setup, ultimately creating a low-glucose-suspend-mode closed loop when people are first setting up their closed loops. People have to intentionally change this setting to allow the system to high temp above a netIOB = 0 amount, which is an intended safety-first approach. One particular feature (“override_high_target_with_low”) makes it easier for secondary caregivers (like school nurses) to do conservative boluses at lunch/snack time, and allow the closed loop to pick up from there. The secondary caregiver can use the bolus wizard, which will correct down to the high end of the target; and setting this value in preferences to “true” allows the closed loop to target the low end of the target. Based on anecdotal reports from those using it, this feature sounds like it’s prevented a lot of (unintentional, diabetes is hard) overreacting by secondary caregivers when the closed loop can more easily deal with BG fluctuations. The same for “carbratio_adjustmentratio”, if parents would prefer for secondary caregivers to bolus with a more conservative carb ratio, this can be set so the closed loop ultimately uses the correct carb amount for any needed additional calculations. I’ve written about autosensitivity before and how impressive it has been in the face of a norovirus and not eating to have the closed loop detect excessive sensitivity and be able to deal with it – resulting in 0 lows. It’s also helpful during other minor instances of sensitivity after a few active days; or resistance due to hormone cycles and/or an aging pump site. Autosens is a feature that has to be turned on specifically (like AMA) in order for people to utilize it, because it’s making adjustments to ISF and targets and looping accordingly from those values. It also have safety caps that are set and automatically included to limit the amount of adjustment in either direction that autosens can make to any of the parameters. Thanks to Intel, we were introduced to a board designer who collaborated with the OpenAPS community and inspired the creation of the “Explorer Board”. It’s a multipurpose board that can be used for home automation and all kinds of things, and it’s another tool in the toolbox of off-the-shelf and commercial hardware that can be used in an OpenAPS setup. It’s enabled us, due to the built in radio stick, to be able to drastically reduce the size of an OpenAPS setup to about the size of two Chapsticks. As soon as we were working on the Explorer Board, I envisioned that it would be a game changer for increasing access for those who thought a Pi was too big/too burdensome for regular use with a DIY closed loop system. 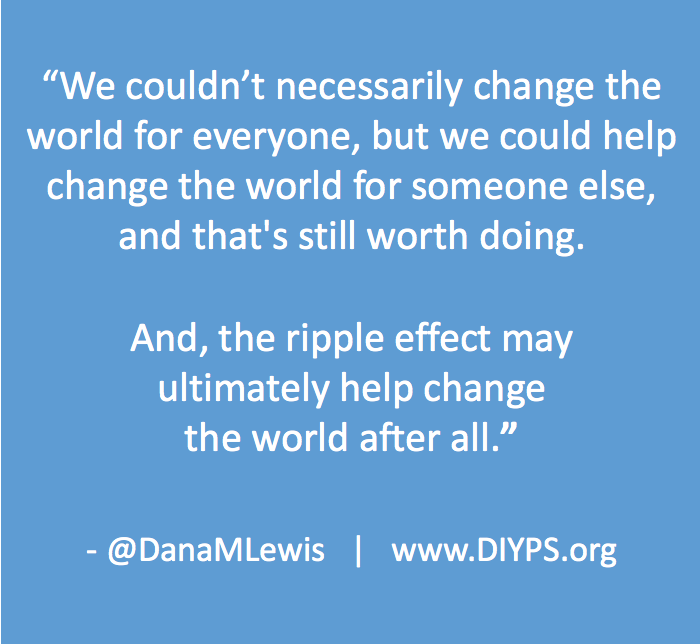 I knew we had a lot of work to do to continue to improve the setup process to cut down on the friction of the setup process – but balancing that with the fact that the DIY part of setting up a closed loop system was and still is incredibly important. We then worked to create the oref0-setup script to streamline the setup process. For anyone building a loop, you still have to set up your hardware and build a system, expressing intention in many places of what you want to do and how…but it’s cut down on a lot of friction and increased the amount of energy people have left, which can instead be focused on reading the code and understanding the underlying algorithm(s) and features that they are considering using. 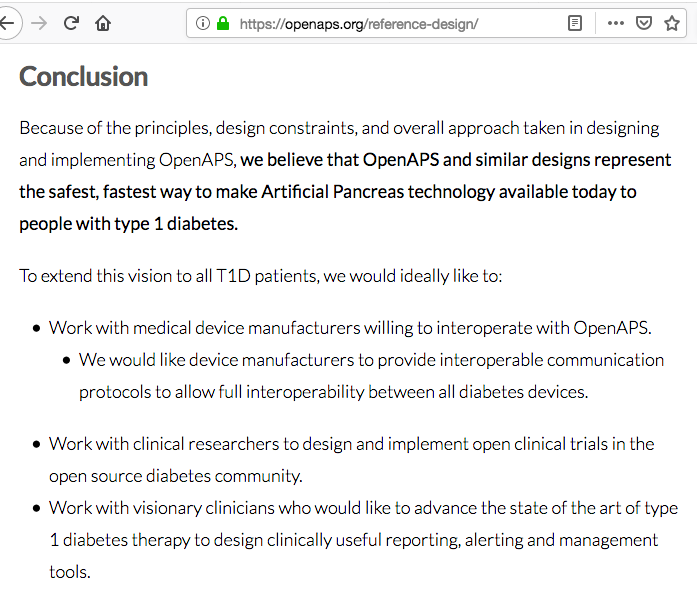 The OpenAPS “docs” are an incredible labor of love and a testament to dozens and dozens of people who have contributed by sharing their knowledge about hardware, software, and the process it takes to weave all of these tools together. It has gotten to be very long, but given the advent of the Explorer Board hardware and the setup scripts, we were able to drastically streamline the docs and make it a lot easier to go from phase 0 (get and setup hardware, depending on the kind of gear you have); to phase 1 (monitoring and visualizing tools, like Nightscout); to phase 2 (actually setup openaps tools and build your system); to phase 3 (starting with a low glucose suspend only system and how to tune targets and settings safely); to phase 4 (iterating and improving on your system with advanced features, if one so desires). The “old” documentation and manual tool descriptions are still in the docs, but 95% of people don’t need them. ..and that was all just things the community has done in 2016! There are some other exciting things that are in development and being tested right now by the community, and I look forward to sharing more as this advanced algorithm development continues.